20 Times Square was formerly the home of the Columbia Theatre from 1910 to 1960, which underwent two renovations and saw multiple iterations of its exterior signage. The building was then rebranded as the DeMille Theatre in 1960, the Mark I,II, III Triplex in 1976, the Embassy 2,3,4 in 1977, and the Embassy 1,2,3 in 1997. By 2000 it was internally abandoned with the exception of the ground floor, which held a Sbarro Pizzeria and Famous Dave’s B-B-Q through the first decade of the twentieth century. 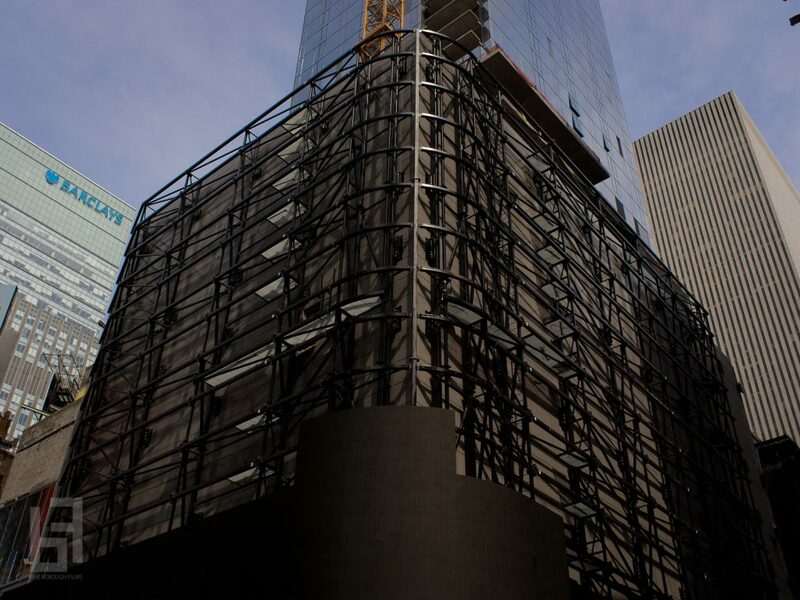 In 2014, partial demolition around the preserved, remnant steel perimeter structure began, as explained in this detailed YIMBY article. Most of the work went into the extra steel reinforcements needed to brace and utilize the old structure that was left standing. 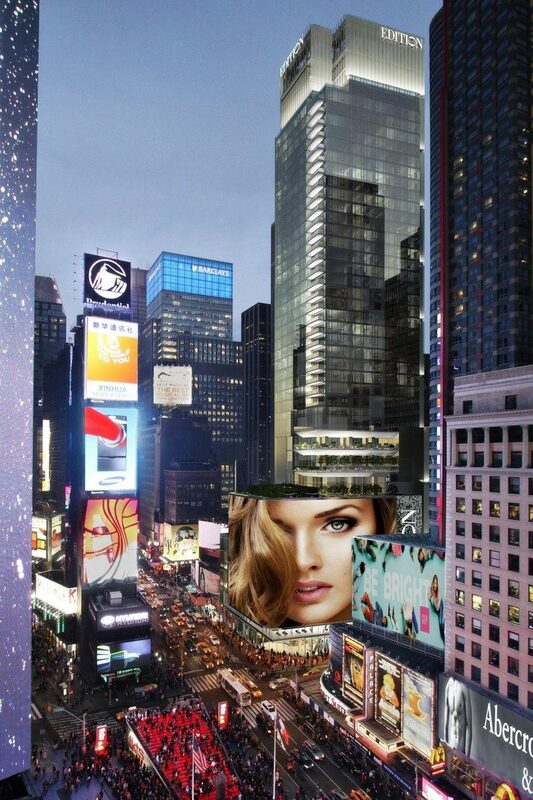 It would be integrated and used to once again hold billboards, but on a much larger scale. 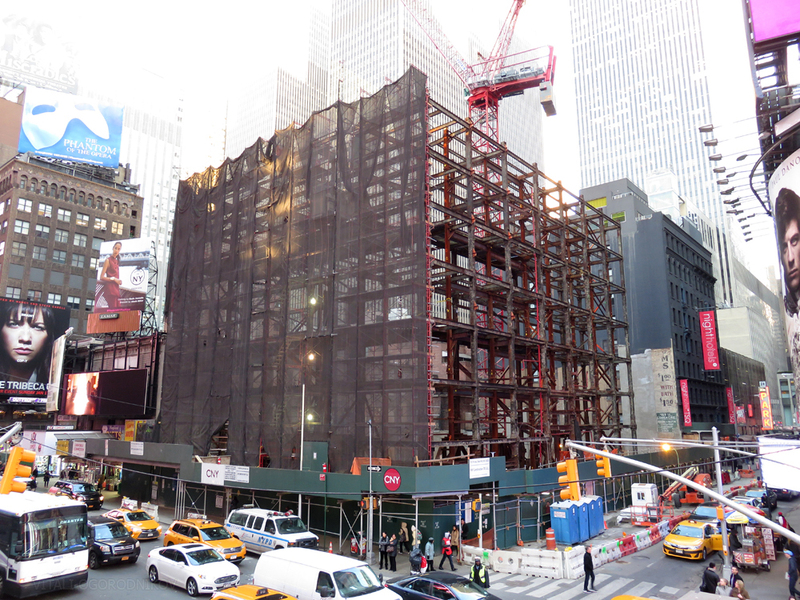 Four years later, the old and new steel structure hide behind an eight-story wrap-around screen above 47th Street and 7th Avenue. 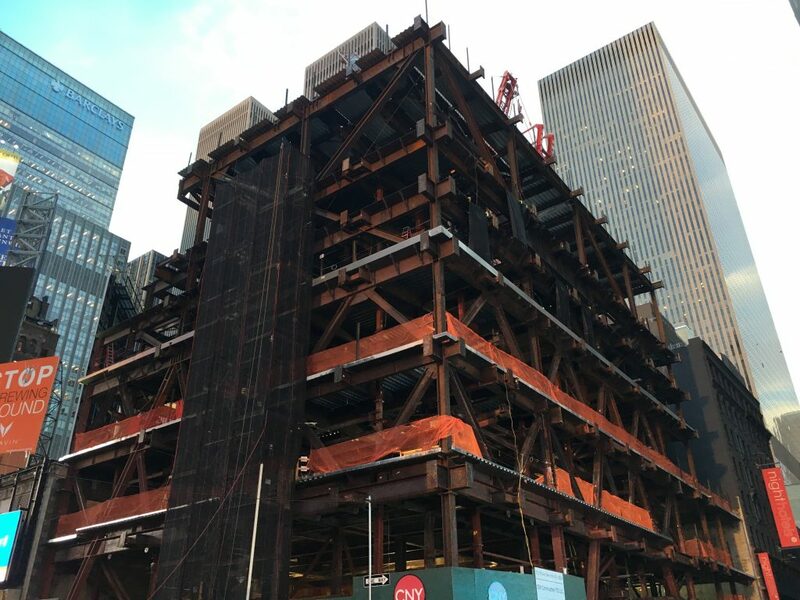 Photos below give a brief overview of the superstructure’s rise over the past three years. When the new LED screen was turned on and tested in mid-2017, an array of bright, geometric and boldly colorful moving patterns and landscapes began flashing across the eight-story screen for the first time. 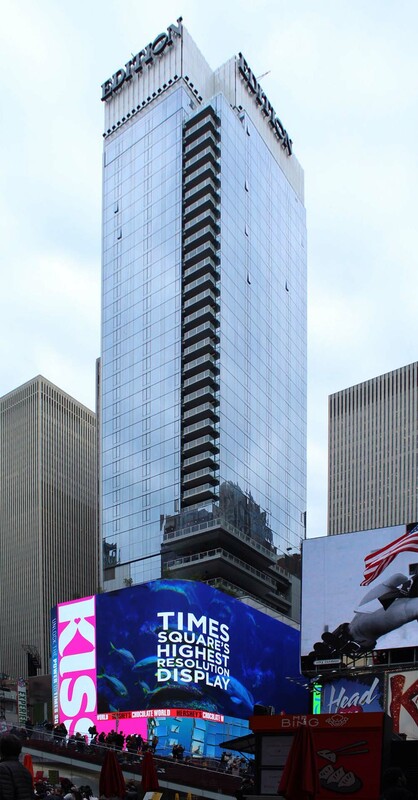 20 Times Square’s billboard is just one of several large new screens in the vicinity embracing new advertising technology, as tourists continue flocking to the Crossroads of the World in record numbers. 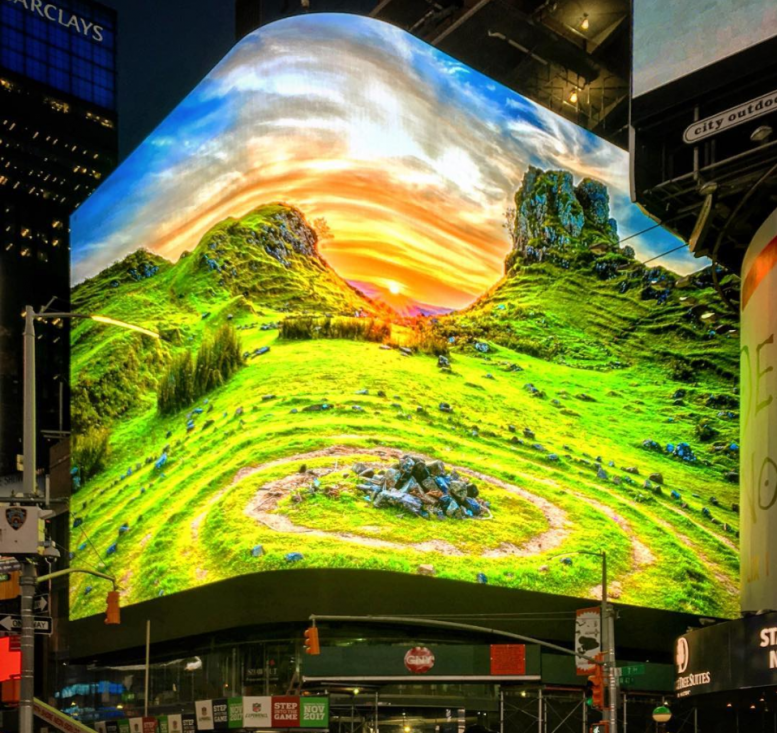 As of now, 20 Times Square’s LED screen comes in second place to the 25,000 square foot LED screen at the Marriott Marquis, rising above the intersection of Broadway and 7th Avenue. Hotel bookings are currently open and available through the building’s main website. The first guests check in on February 1, 2019. 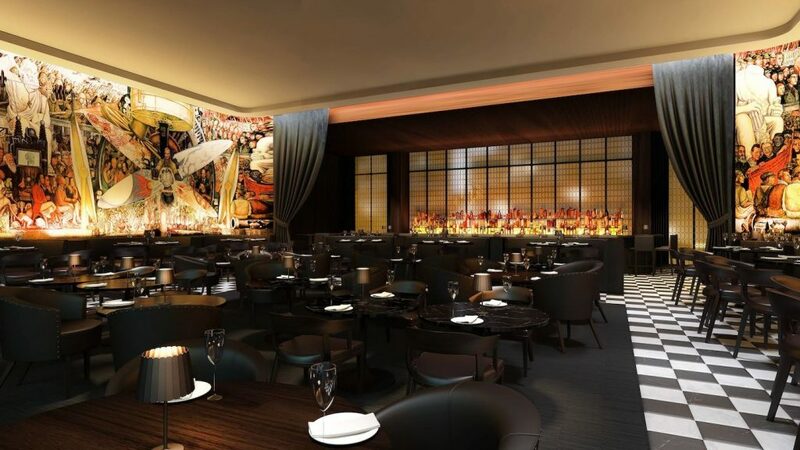 3 Comments on "452-Key Marriott EDITION at 20 Times Square Plans For February Opening"
Please pardon me for using your space: Don’t look at me I told her on screen. I’m shy. Thanks to Michael Young according to my manners. There must have been a zoning advantage to keeping the old theater since it sounds like nothing much of the original construction remained. Or perhaps no theater can be demolished – anymore. I can afford to pay $850 for a studio. I’m 71. 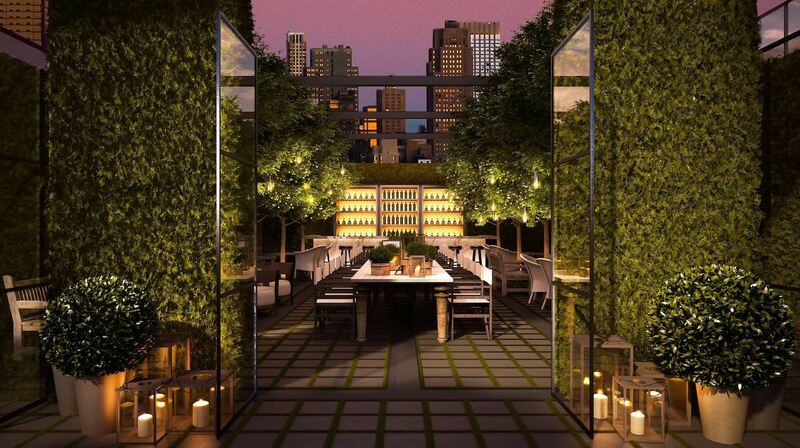 I would 💘 to live in a luxury building with a swimming pool. What are my chances?